Imagine, transporting a majestic tropical rainforest into the middle of the city in a completely new urban residential concept. A true oasis in the city with skyscrapers sprouting like redwoods reaching for the heavens. Each building speckled with multiple sky gardens and every edifice reflects a sense of fluidity, with their designs replicating the movement of streams that trickle down a mountain side. Collecting in a tropical basin that finds its culmination in three iconic waterfalls that seemingly flow into a mighty river. Six towers preside over the masterplan, each named after some of the most beautiful waterfalls in the world. The Acqua masterplan devotes 70% of the entire property to open space, from rainforest-inspired landscaping, lagoon pools, waterfalls, walking trails, and pocket gardens across varying levels on all buildings and rooftops, complete with rock formations, treetop canopies and ponds. 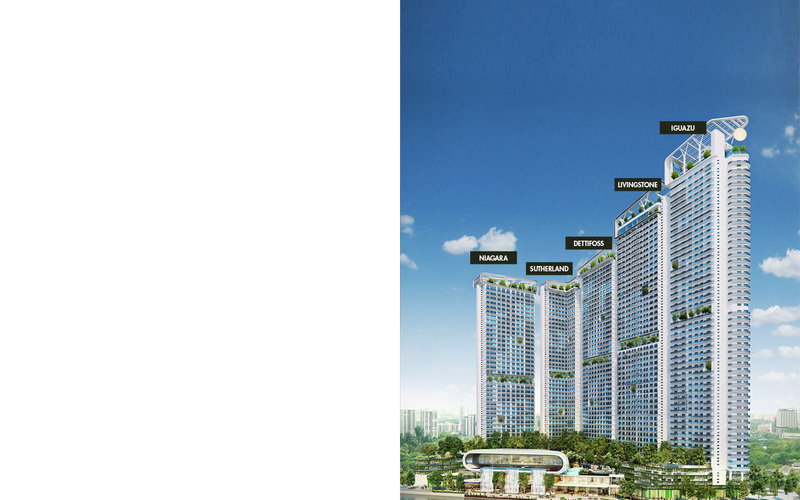 Situated at the convergence of Mandaluyong and Makati, right across the central business district via a new bridge, Acqua rewards residents with all the best that both cities have to offer. Acqua Iguazu LTS no. 28552; Owned by Century Limitless Corp., developed by Century Limitless Corp.